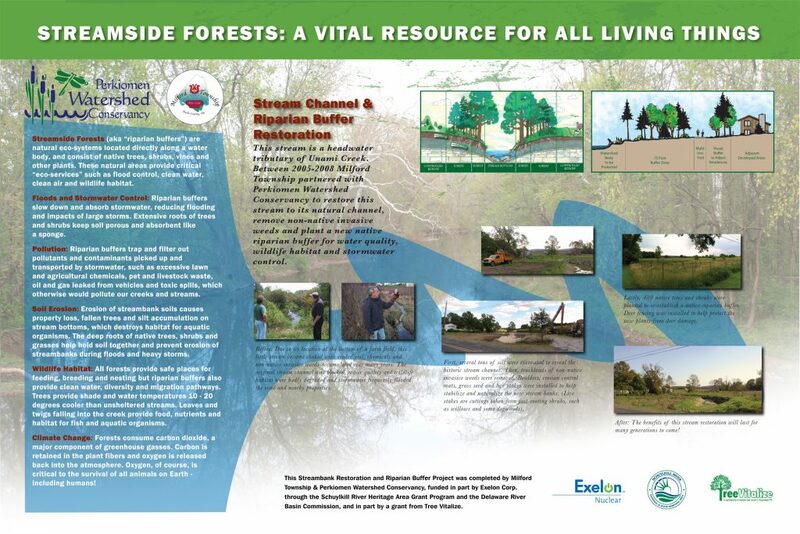 Milford Township strives to protect its vast natural resources. The township contains large portions of the Unami Watershed, which is classified as a High Quality Stream. In order to protect our water and land resources, the township actively buys select parcels of land and designates them as Open Space . The township uses open space purchases and land development procedures to help prevent pollution from entering the land and streams. The township also works closely with the Department of Environmental Protection in order to prevent pollution and contain any pollution events that have occurred. Milford Township offers a recycling center for residents to use. The recycling center is located at the Public Works building next to the Township Building, across the street from Molasses Creek Park. If you use containers to hold your recyclables, use only paper bags or cardboard boxes. No earth, rocks, or sod. No materials over 4″ in diameter. No plastic bags as they do not compost. Plastic, ONLY Grades 1-2. Please consult the bottom of the container for grade number. Click here for Hazardous Waste Collection Information. Out of sight, out of mind? Most people don’t think of stormwater unless it invades their basement or floods a road. But how we handle stormwater determines whether it will be a hazard or a precious resource.Stormwater runoff occurs when water from rain or snow and ice melting flows over the ground. This water can become a problem when it picks up debris, chemicals, dirt and other pollutants as it flows or when it causes flooding and erosion of streambanks. Stormwater travels overland, into swales and through a system of inlet, pipes and basins that make up storm sewer systems. It eventually flows directly to a stream or wetland. Unless we treat this water, all of the pollutants it carries will empty into our surface waters. Properly dispose of hazardous substances, such as used motor oil, cleaning supplies and paint – never pour them down any part of the storm sewer system, and report anyone who does. Use pesticides, fertilizers and herbicides properly and efficiently to prevent excess runoff of these items. Look for signs of soil and other pollutants, such as debris and chemicals, leaving construction sites in stormwater runoff or tracked into roads by construction vehicles. Report poorly managed construction sites that could impact stormwater runoff to the Township. Install innovative stormwater practices on residential properties, such as rain barrels or rain gardens, that capture stormwater and keep it on-site instead of letting it drain away into the storm sewer system. Report any discharge from stormwater outfalls during times of dry weather – there could be a problem. Pick up after pets and dispose of their waste properly. No matter where pets make a mess – in a backyard or on open space – stormwater runoff can carry pet waste from the land to the storm sewer system to a stream. Store materials that could pollute water indoors and use containers for outdoor storage that do not rust or leak to eliminate exposure of materials to stormwater. The Bureau of Point and Non-Point Source Management’s homepage. Technical and regulatory information about the National Pollutant Discharge Elimination System (NPDES) stormwater program. 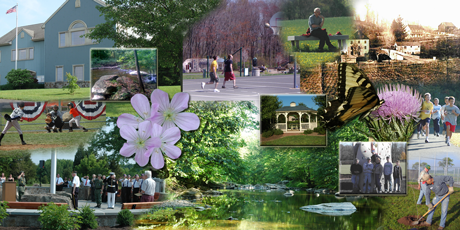 The Bucks County Conservation District’s homepage. General programs and contacts serving the counties of Bucks, Chester, Delaware, Montgomery, and Philadelphia. General programs and contacts for Pennsylvania’s DEP. Technical assistance on stormwater management issues maintained by the Center for Watershed Protection. Links to watershed resources including the “Watershed Academy” (free training modules), certification, projects, funding, conferences, tools and media outreach including “After The Storm”. Resources addressing “non-point source pollution” ranging from kid’s education to regulations and training. Scientifically sound information to improve the design, selection and performance of BMPs. Tools and techniques that can be used to meet regulatory and receiving water protection program goals for urban retrofits, re-development projects, and new development sites. A riparian buffer is an area around a stream populated with vegetation such as trees and shrubbery, which helps to increase water quality and reduce pollution. These buffers are an important part of the Unami Water Basin, of which a large part of the waterways run through Milford Township. These buffers accept water run-off from impervious surfaces (driveways, roadways, houses), pesticides from local agriculture, sediment from nearby populated areas, and other pollutants that can interfere with the waterway. The vegetation in the buffer creates a biological filter to help remove nitrates from water run-off. Trees also provide shade for the stream in order to reduce the temperature of the waterway and prevent thermal “pollution” which can kill the fish. Milford Township strives to maintain and, in some cases, build these buffers in order to keep the local waterways clean and free from contamination.